Mr Green has been the ultimate source of new uk bonuses lately, the charismatic Mr Green seems to be busy creating new and appealing promotions for you. Every new event focuses on popular casino games and offer very generous cash prizes. Let’s have a look at what this mid-September has in store at this uk paypal casino. 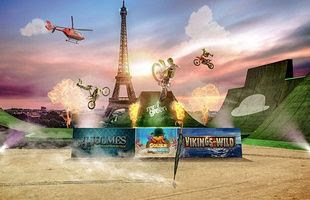 First, you can join Mr Green for a thrilling challenge which could end up with you winning £8000 cash adventure, a VIP Nitro Circus experience, including accomodation, breakfast, lunch, helicopter flight over the city and 4 tickets to the Nitro Circus show in Paris. If you didn’t manage to reach the first position on the leaderboard, no sadness there. All first 400 places will be rewarded with real money prizes, ranging from £20 to £5000 cash (for second place). And the next natural question comes to mind, how to win? Mr Green is giving a comprehensive explanation, you have to complete the missions they have for you and gain new points on the leaderboard. Keep in mind the promotional timeframe spreads from September 10 (that would be today) until Sunday, September 16. During this timeframe, you will have to place Vikings Go Wild slot and collect at least 30 symbols (bonus spins). Another challenge is to reach 4 wins in a row while playing Golden Fishtank. The third and latest challenge within this uk casino promo is to spin the reels of Holmes and Stolen Stones and collect minimum five shards. Another top uk bonus can be redeemed at Mr Green while joining their Bonus Spin Law Enforcer promotion. The total giveaway reaches 1000 bonus spins, the action takes place every day from 17:00 to 22:59, simply go to your account and play the Reel Thrill tournament and you can win a share of the total 1000 bonus spins. Enjoy all new casino deals at this uk casino and good luck from our team!